QE2's mast departing Oslo, Noway on her 1,001 voyage. At the top is the Norwegian flag flown as a courtesy to the port. Below that is the;Cunard house flag, red with a golden lion holding a globe. Below that is the British blue ensign. It indicates that the master of the vessel is an officer in the Royal Navy Reserve. 14 June 1995, was a mostly sunny day in New York City. QE2, as was the custom in those days, sat at Pier 90 at the Passenger Ship Terminal in Manhattan. The pier itself had a double helping of the balloons that Cunard normally decorated the terminal with to give QE2's sailing a festive aura. Any question about why this was to be a special sailing was cleared-up by the Daily Programme, which proudly announced that this crossing to Southampton was “the historic 1,000th voyage of QUEEN ELIZABETH 2”. Passengers were invited onto the open decks for the sail away party including complimentary champagne. Each passenger also received a special pin depicting the ship's trademark funnel and “QE2 1,000” written upon it. On the open decks, Maureen Ryan, the Social Hostess who had worked on the earlier Queens and who would later go on to work on QM2, distributed small British and American flags for people to wave as the ship left Pier 90. Music played over the loudspeaker system as the ship with the aid of several tugs pulled out of the terminal and headed down the river. Overhead, a small airplane trailed a banner saluting QE2. More dramatically, a New York City fireboat escorted the ocean liner down to tip of Manhattan with great plumes of water shooting skyward. Thus, the 1,000th voyage got off to an exciting start. All of QE2's departures from Manhattan, passing the legendary skyline from midtown to downtown, then the Statue of Liberty and then under the Verrazano Narrows Bridge, were exciting to one degree or another. But, this one was more so. Everything went smoothly and there was a feeling that this departure was a tribute to all that had gone before. Weather on the North Atlantic is often a wild card. It can confound the best forecasts. And, the weather during the 1,000th voyage was unexpected. It was like sailing on a lake with the sun shining brightly overhead. Captain (later Commodore) John Burton-Hall commented that it was more like a Caribbean cruise than an Atlantic crossing. Thus, even the weather co-operated. The 1,000th voyage was a five-day crossing. This meant that the ship would leave New York late in the afternoon of the first day and arrive in Southampton, England late in the afternoon of the fifth day. There would be four nights onboard. In order to maintain this schedule, the ship would have to run at 28 to 30 knots, close to her full speed of 33 knots. The pulsation of the engines and the ship speeding through the waves added to the excitement. The evenings on a five-day crossing followed a set pattern. The first night was informal, defined as jacket and tie for men and dresses for women, in deference to the notion that passengers would still be unpacking after coming aboard. The next, three nights would be formal, tuxedo or dark suit for gentlemen, gowns or cocktail dresses for ladies. With the thought that passengers might wish to pack their formal attire in anticipation of the next day's disembarkation, the last night was always informal. On the first formal night, the captain would host a reception for the passengers dining in the three grill restaurants (Queens Grill, Princess Grill, and Britannia Grill) and the Caronia Restaurant. The next night, there would be two receptions in the Queens Room, one for each of the seatings in the Mauretania Restaurant. The third night would be the private party night. The captain, the chief engineer, the hotel manager, and the ship's doctors would hold invitation-only parties in their quarters (or, in the case, of the doctors in the Two Deck area outside their consulting room). These were relatively small gatherings and the invitations were highly-prized. Each party had its own constituency amongst the passengers and its own reputation. The captain's party was the top-of-the-line party where one would expect to meet any celebrities, politicians and other notables who might be aboard. In addition, the guest list would include the people who traveled the most often on Cunard and those who had developed friendships with the Deck Department. The chief engineer's party was known for high-spirits and its constituency was the regular passengers who knew people in the Engineering Department. Not surprisingly, the Hotel Manager's party was known for having the best food and was populated primarily by people well-known to the Hotel Department. The doctors party had for a time the reputation of having the most young women attending. Many young officers would repair there after their own department's party had ended. 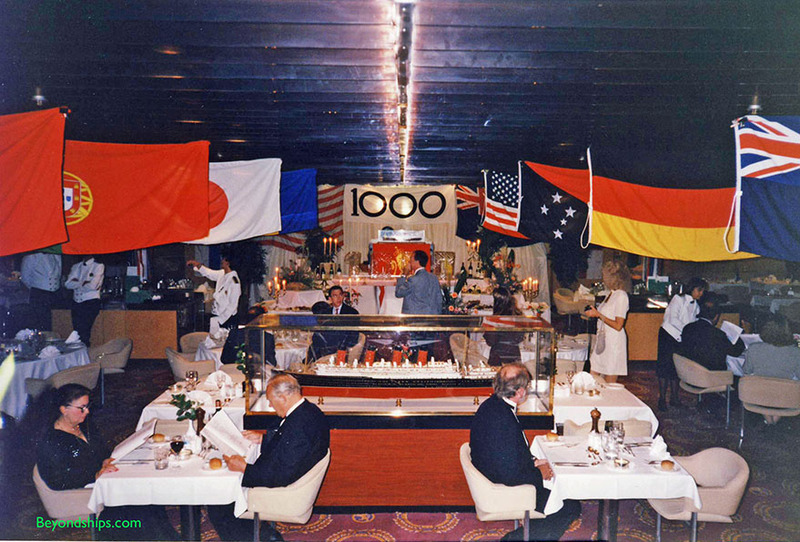 On the 1,000th voyage, the third night was also the night of a special gala dinner. There was usually a gala dinner on the third night of a crossing but this time the restaurants were decorated with more than the usual array of flags from different countries. 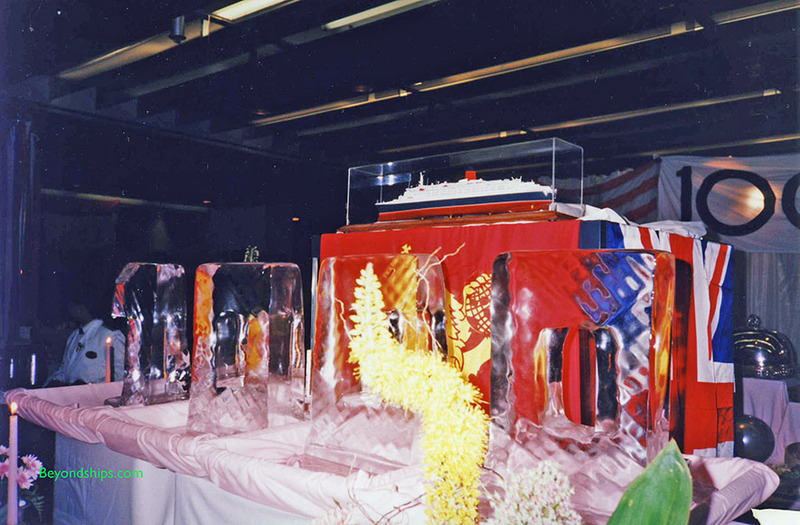 There were ice sculptures, models of the ship and food displays all marking the 1,000th voyage. A special menu souvenir program was printed and given to the passengers with choices of lobster, duck or prime rib as the main courses. It ended with one of QE2's signature Baked Alaska parades. The final night of the voyage was the Ward Room party. 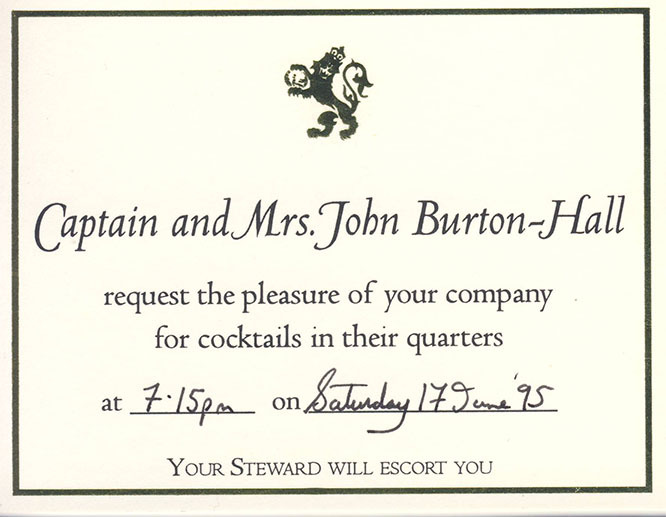 Again, this was an invitation-only party and it was held in the officers' ward room overlooking the bow of the ship. What made this party particularly special was that it was made-up of people that the officers had decided to invite. No one was there because the home office thought they should be invited. As a result, it was the true QE2 insiders party. During the days, there were activities, films and lectures. Because the weather was so perfect, these competed with outdoor sports and with the deck chairs for the passengers' attention. A Canadian air force Orion greeted QE2 by making several low passes over the ship during the first day at sea. On the fifth day, a Royal Navy destroyer approached QE2 off the Isle of Wight and escorted her towards Southampton. Fireboats appeared and again towers of water shot skywards. At close to five in the afternoon, the ship tied-up at the Queen Elizabeth II terminal and the majority of the passengers disembarked. Because the arrival was so late in the day and to allow the crew some time to celebrate the 1,000th voyage, QE2 had a rare overnight stay in Southampton. The next day, the small cadre of passengers who had remained with the ship from New York were joined by more than 1,000 new passengers for the cruise to Oslo, Norway, Stockholm, Sweden, and Copenhagen, Denmark. Cunard was also treating QE2's 1,001 voyage as a special voyage and once again there was a festive disembarkation. Again, the weather cooperated throughout the cruise. Amongst the highlights of that cruise were the throngs of Swedes who came down to see QE2 in the small village of Nynashamn where she was landing passengers to visit Stockholm. Then, off of Denmark, a small helicopter landed on Sun Deck as part of an attempt to establish some type of record. Exactly what the record it was hoping to achieve was not clear but it was an exciting event. 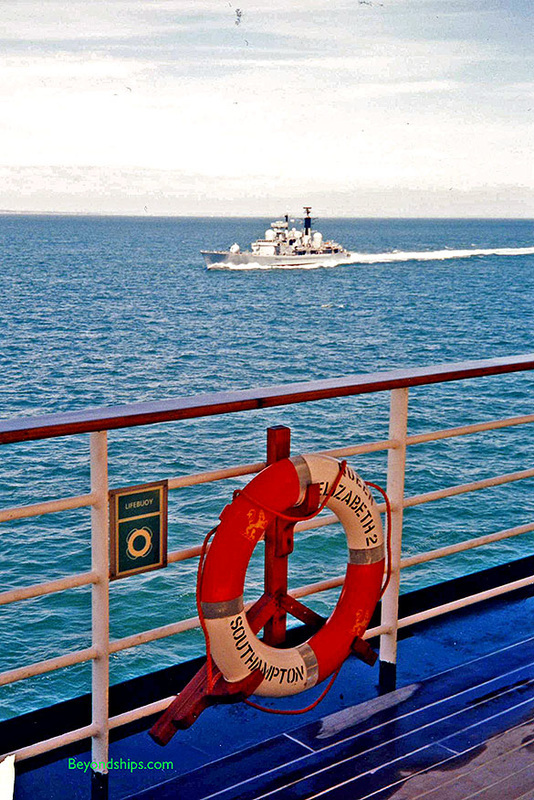 In many ways, QE's 1,000th and 1,001st voyages were normal cruises with a few special events. Everything went as planned, there were no technical problems and the passengers enjoyed themselves. What makes these voyages important, however, is that they did run smoothly and without incident. This was first time the ship was involved in a special event since the refit disaster and QE2 performed at her best while in the public eye. Those watching saw that not only has this ship accomplished quite a lot but she has all of these new amenities and decor that seem to be working quite well. As a result, people were starting to re-think whether QE2 was really the bad joke that she had been portrayed as following the 1994 refit. It would take some time but QE2 was regaining her image. The Mauretania Restaurant, as it then was, arrayed for the 1,000th voyage celebratory dinner. Below is a closer view of the central display. 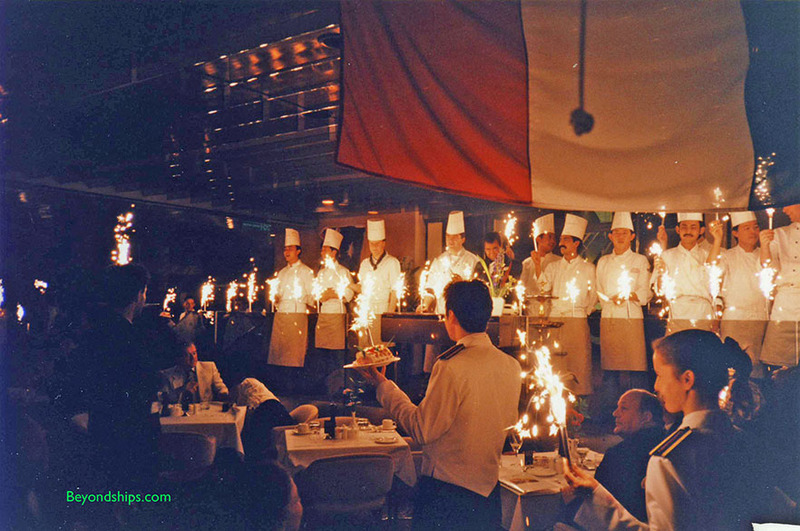 Above: The chefs and waiters hold sparklers during the Baked Alaska Parade at the end of the gala dinner. Below: ;Social Hostess Maureen Ryan interviews Captain John Burton-Hall. 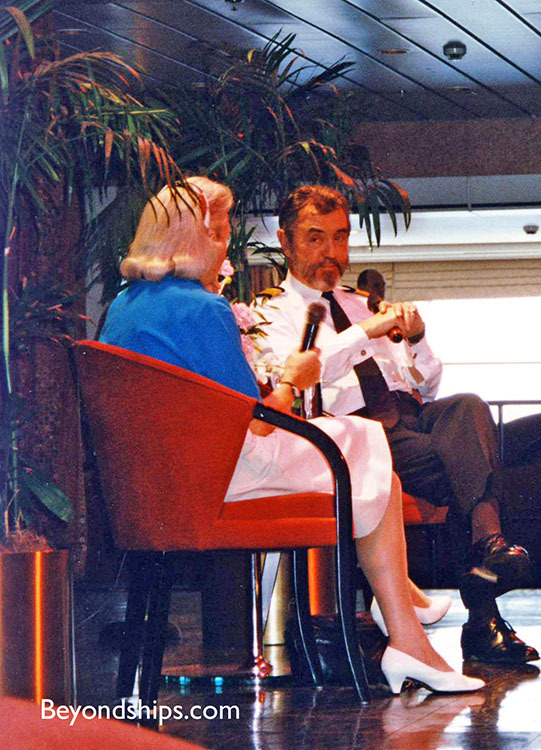 The captain's interview was a regular part of the daytime activities during a crossing. Above: A Royal Navy Type-42 destroyer comes along side. 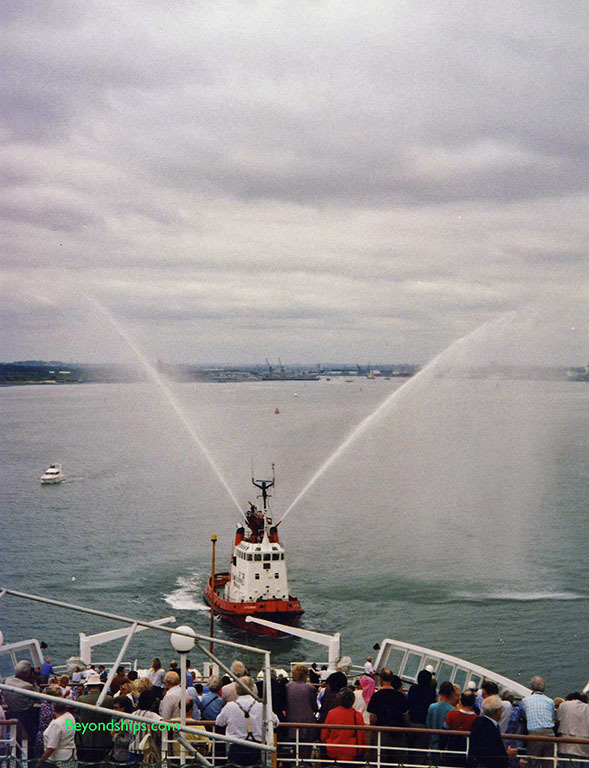 Below: A fireboat salutes QE2 in Southampton Water. 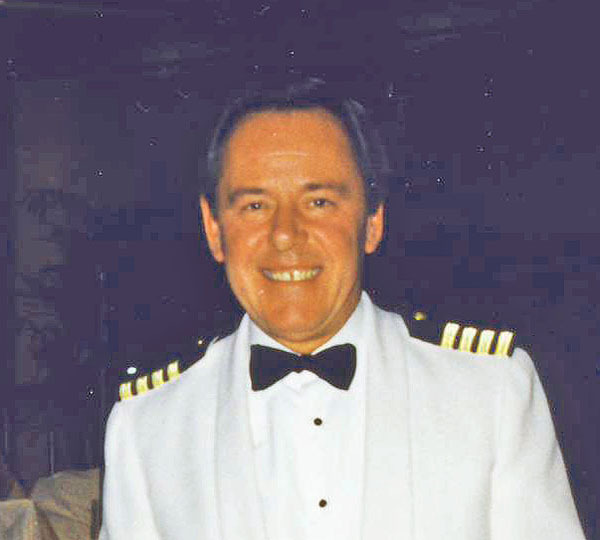 Above: Staff Captain Ron Bolton was second in command during the 1,000th voyage.